At long last, the first part wraps up. If you want to enhance your experience, go here http://cdbaby.com/cd/wattre and listen to track 9 “Reeling” while imagining end credits rolling. Alternately, you can imagine Semisonic’s “Closing Time” playing as the scene ends, then fading into “Reeling” as the credits continue, and finally ending with The Birthday Massacre’s “Kill The Lights”. Wooooo! Good end! Good end! I’ve been following your work on Drunk Duck for quite a while. Awesome job, just awesome, and one heck of an ending to the first day! Loved it, so when it ended at DD, I had to follow here. I approve of H20′s approval of this comic. So you were born, and that was a good day. and nothing and no one can ever take that away. I love your comment. It was very poetic. Amazing. I read this all in a day, and to be quite honest I thought it was amazing. I am sore amazed. So often I find a story, and when the creator gets to the end of the first installment he has told it all, and of course it is down hill from there. There is so much left to tell here, and this is one of the few comics I check every day, and check first. I assume there is a good reason for leaving DD, I probably wouldn’t have found you if you hadn’t been there, but I am happy to follow you as long as the story continues. Hey man, I’ve been reading your comics on Drunkduck, and I just wanna say that your comics are some of the best I’ve seen around heya’. My morning usually consists of checking Ctrl+Alt+delete, VGCats, and then just reading your comics over and over again. And over. The characters are really well thought out, with all of the comics explaining what kind of person they are, and it actually makes me feel like I’ve known them my whole life. 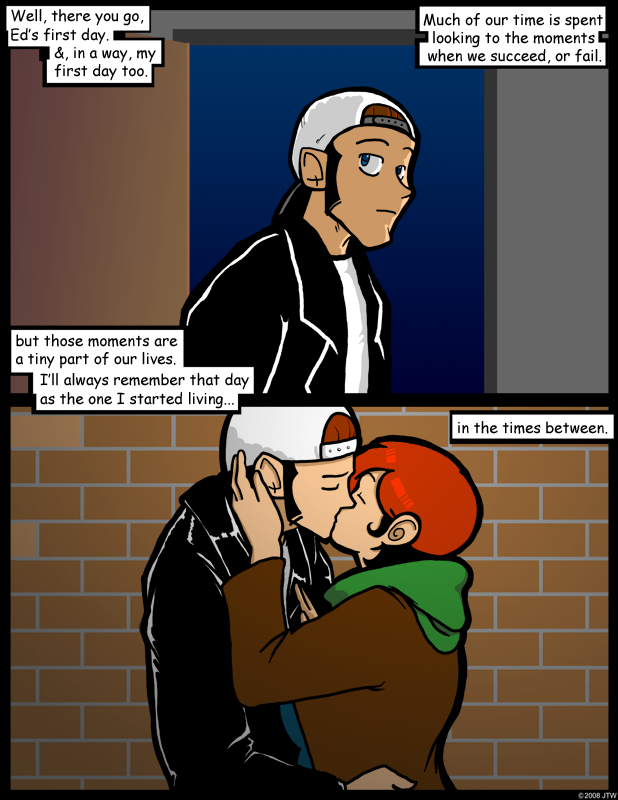 This comic itself is a beautiful ending, showing just the difference between how the day began and then ended, and Thomas’ PoV on what’s changed, such as a new member of their group, a relationship with an old member, and a third (Brooksie) being more open, I definitely noticed. Can’t really describe the changes or non-changes, but I’m looking forward to the plot lines hinted at in the first “season”, such as the confrontation between Thomas and his ex. I keep on thinking that a twist would be that she wants to get back together, but I’m obviously wrong. I’m forcing myself to stop here for the night. I read to this far in one day. Couldn’t stop. Its amazing. Can’t wait to continue. I love these characters. Crave: Thanks for reading it and commenting. I’m glad you enjoyed it. One day in more than a year. You’ve got to love Webcomic Time. I read a lot of webcomics…but this one is now my favorite. I’m reading through the archives currently, and while I absolutely love your comic, I must say this is the longest damn day ever. Ah, but when you consider how much happened, I would paraphrase Gandalf is saying that it was exactly as long as it needed to be. How many comics so lovingly depict how someone can be reborn into a world that isn’t as bleak as they thought? You know, I can totally hear this being said in JD’s voice from scrubs. it’s so deep and nice. I imagined the first few main actors identified, then the director. Then Reeling started. After the singer said simple feelin’, it instrumental’d until the final chord, held as the copywriters displayed.